A tourist attraction which re-opened in 2014 after a £3.74m renovation has closed. The trust which runs which runs the Grade I-listed Wentworth Castle Gardens near Barnsley, South Yorkshire, said it could no longer afford to stay open. The 18th Century gardens were renovated and the dilapidated Victorian conservatory re-opened in 2013. 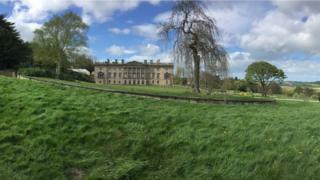 Wentworth Castle and Stainborough Park Heritage Trust said it was working with Barnsley Council on the closure. More than £20m has been spent on the gardens in the past few years, with 20 historic buildings and monuments restored. Although the park and gardens attract tens of thousands of visitors a year, the trust said: "In recent years we have not been able to make enough money to cover the running costs [for] a year-round visitor attraction." It is now hoped the grounds will be maintained and a sustainable future can be found. John Edwards, chair of the trust, said: "It is with sadness we have decided that the gardens will have to close to the public. "The trustees would like to say a huge thanks to all the staff, volunteers, friends and others who cherished and improved the gardens and parkland. "They should all be very proud of the national recognition their achievements have created." Image caption The trust has said "every effort" will be made to "honour all existing weddings and celebratory events for 2017"